This book is a nice enjoyable read with a really heart-warming story. Not wanting to give too much of the plot away, this story follows the lives of a famous Hollywood actress Jodi Ludlam who has come back to her roots to live in the Dublin Village of Bakers Valley in Ireland and raise her young son, Saul, and where she also has to face some ghosts from her past, and also the life of one of the villagers Francine Hennessy, who goes from being a work-a-holic to been a full-time mum and how she copes with all the difficulties thrown at her along the way. However these two women cross paths & form an unlikely friendship. Now picture a beautiful cottage with country village surroundings. Beautiful, but she cannot escape her popularity and is recognised by many of the Mums in the school playground when she enrolls her son at the school. Of course, typical to human nature most of them are gasping for breath and wanting to make a friend of her. There is also a valuable lesson in life there also but I'll leave that to the reader to find that out. Although Emma Hannigan has had 6 bestselling novels in the last number of years, this was my first time to read a book by this author. I was quite intrigued by the beautiful cover & couldn't wait to get started on it. The chapters flowed really well, the characters were well developed & believable. 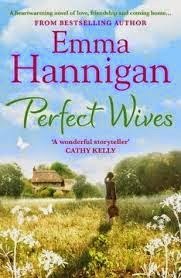 It's not a straight forward story at all, I think Emma Hannigan has weaved a brilliant piece of artwork and keeps you slowly trailing along a path where clues are, but you just don't pick them up. It was a really easy read and the pages just kept on turning. I will definitely read a few of her other novels now. Thank you to Headline Review via Margaret Madden for allowing me to read and review this lovely book. I thoroughly enjoyed it. This book is available on kindle & in all good bookstores.